We all have excuses for not writing. 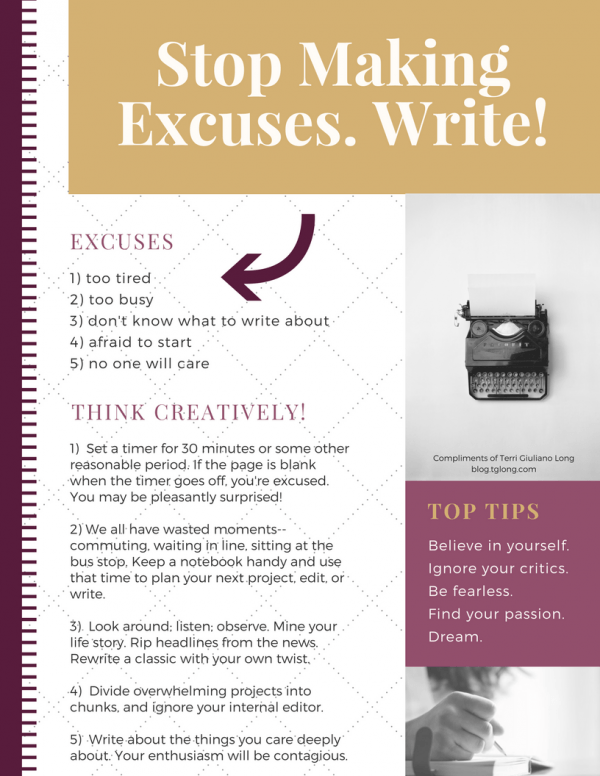 For some of us, excuses cause a lapse of a day or two, a week or three, but serious writers find a way through. We have to or we’d never set words to paper. Making excuses doesn’t make us bad people. It makes us human. 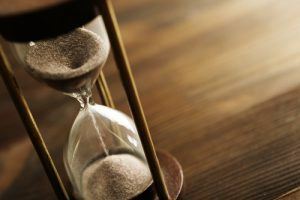 Still, procrastinating can keep us from accomplishing our goals, so it’s worth examining our reasons for not writing. Are they really excuses? If so, why are we letting them stand in our way? Here are ten of my favorites. 1) I’m too tired to write. Let’s face it, in today’s crazy-busy world, we’re all exhausted most of the time. Being tired is an excuse. And that’s really all it is: an excuse. Next time you feel too tired to write, sit at your desk, log onto your computer, and wait. Set a timer for, maybe, 30 minutes, doable enough that you don’t feel pressured, yet enough time to give your brain a chance to gear up. 2) I don’t have time. Or – I’m too busy. See “I’m too tired to write.” We’re all busy. It’s not that successful people have more time than others; it’s that they make time to do the things they consider important. Do you commute to work by bus or train? There’s your perfect opportunity to write. Some moms write during their kids’ naptimes; other authors wake early or stay up late to write. If you want to fit it in, you can. 3) I have no training or experience. While training and experience are by no means a guarantee of success, this is actually a decent reason to put off publishing for a while. Notice I didn’t say put off writing. Writers learn to write by reading and writing. As the saying goes, practice makes perfect. Assuming you read your work critically, or work with a writing group or editor who does it for you, the more you write the better a writer you’ll become. If that’s not enough to bolster your confidence, consider taking a class at a local adult center or university. Or pick up one of the many wonderful how-to books on writing. My favorite is Writing Fiction: A Guide to Narrative Craft, by Janet Burroway. 4) I don’t know what to write about. If only I had a nickel for every time I’ve heard this excuse. Writing is easy; staring at a blank page is hard. Slow down, and look around. Listen and observe. Mine your life story for interesting ideas you might turn into fiction. Reread the classics and consider possible twists. Read or listen to the news. Jodi Picoult routinely rips plots from the headlines, while nonfiction author Susan Orlean bases her books on stories she read in the news. Here are some great tips from the inimitable writer and instructor, Joanna Penn. 5) I don’t know enough about the subject; I haven’t done the research. Then do the research already! Or dive right in and imagine the details. In fiction, the details must be believable, but not necessarily precise. As Darin Strauss, a wonderful writer, author of one of my favorite books, Chang and Eng, puts it: “Your requirement is not to be history-book-grade accurate. It’s for the reader to buy it enough to follow the magic trick of fiction. 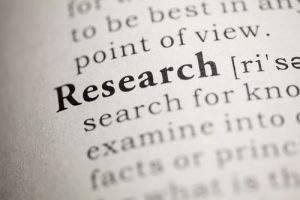 As long as the reader doesn’t say, “This smells like fakery,” who cares?” Of course, if you’re writing nonfiction, return to sentence one and start learning the facts. 6) I’ll start my book next week, next month, next year, or when I retire. Ah, the infamous someday. Translation: the same day you’ll start eating healthier, exercising, quit smoking, read more, smell the roses… Procrastinating an overwhelming task is not a character flaw. We all resolve to do any number of things we never get around to actually starting. Mostly because we’re intimidated or scared. Writing, particularly for an audience, is terrifying. To write honestly, you have to bare your soul, then be prepared for readers to hate your work and sling mud. Hardly a motivating scenario. The truth is, we’re all scared. If penning that book is important enough to us, we bare through. Here Writer’s Digest offers some great tips for how to do it. Here are more tips from Lifehack. 7) I’m too old, too young, too stupid, too lazy; I have no attention span. You know yourself better than anyone else knows you, so maybe one—or possibly two—of these excuses are true, and really do hold you back. More likely, they’re the go-to excuses (read: rationalizations) you use to cover your real reason for not writing: you’re scared. You don’t know if the work will turn out well, if people will love you or hate you, if you’ll be able to accomplish what you set out to do. We all—repeat: all—have these fears. The first step in conquering any fear is to name it, and face it head on. 8) I’m waiting for the Muse. In case no one has let you in on the secret, “the muse” is a big, fat, mean old phony—at least as perceived by novice writers or excuse-making pros. The muse, if you will, refers to your inner creativity. If you’re lucky, very, very, VERY lucky, maybe she’ll show up once or twice in your lifetime with a fully or nearly fully-formed story you have only to record. More likely, if you treat her well, she’ll hint at an idea you have to work with and shape, or perhaps provide hints along the way. When people say or feel that they’re waiting for the muse, what they actually mean is they’re feeling blocked. Writer’s block is usually caused by stress and anxiety, or an overly critical internal editor, who bashes every idea you come up with. Here is a great post from Joe Bunting on how to get your muse talking—or (more accurately) how to unblock. 9) No one will care what I have to say. Maybe you’re right. Maybe they won’t. It isn’t the world’s job—or any reader’s job—to care about what we have to say. It’s our job to make readers care. The best way to write a story, or a book, readers will care about is to write a story you care about. That’s not to say self-indulgence is the new orange. Enthusiasm is catching. When we’re passionate about our work, our excitement can’t be contained. When a story moves us, we’re more willing to go the extra mile, to push ourselves harder, to take chances. This, more than any other piece of advice, will help you to beat any excuses. 10) I’m embarrassed OR I don’t want to embarrass anyone. As with many other excuses, there’s a grain of truth here. Writing honestly, whether fiction or nonfiction, requires us to give ourselves over to the work. When we do so, even if not a single plot detail in the story is true to our life, we inadvertently tell readers a lot about ourselves, in what we choose to include and what we leave out, where we focus, how we make sense of details or events. Again, even if nothing in the story happened to us, those readers who can’t imagine making up a story out of whole cloth will assume your story is autobiographical. That can be embarrassing and protesting only serves as confirmation. Other than taking the high road, reminding yourself that the story isn’t you and you’re not the story, there’s not a lot you can do. Sometimes the story you want to tell is true to your life. In that case, if you’re worried about embarrassing or offending people, you can either wait until anyone likely to be offended is deceased, or you can change the details enough so that characters and events are not recognizable. This is easier than it sounds. 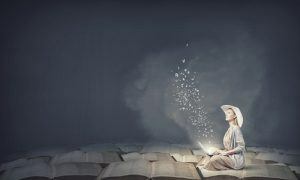 Many writers use a real person as inspiration for a character, changing gender, race, nationality, gestures, speech patterns—all the essential details that make that person identifiable. But take precautions: while liable cases are rare and must involve defamation of character, angry subjects do occasionally file suit, and even if you win, lawsuits are painful. Here’s an excellent post from Rights of Writers on libel in fiction and how to avoid defamation. 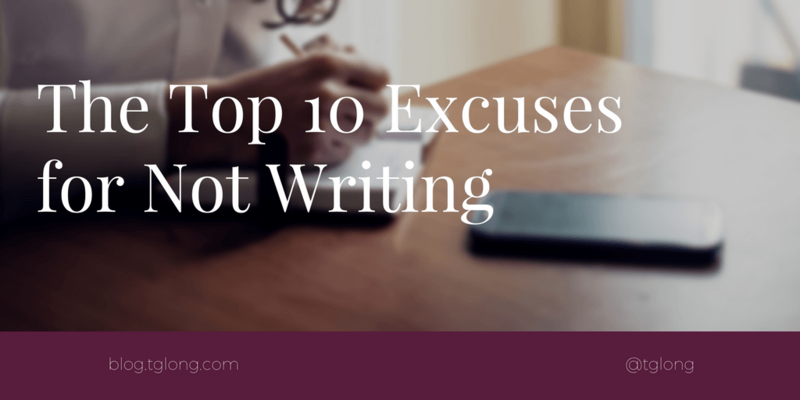 What excuses for not writing would you add to this list? Here are ten common excuses writers use to avoid the pain, or terror, of putting words on paper. 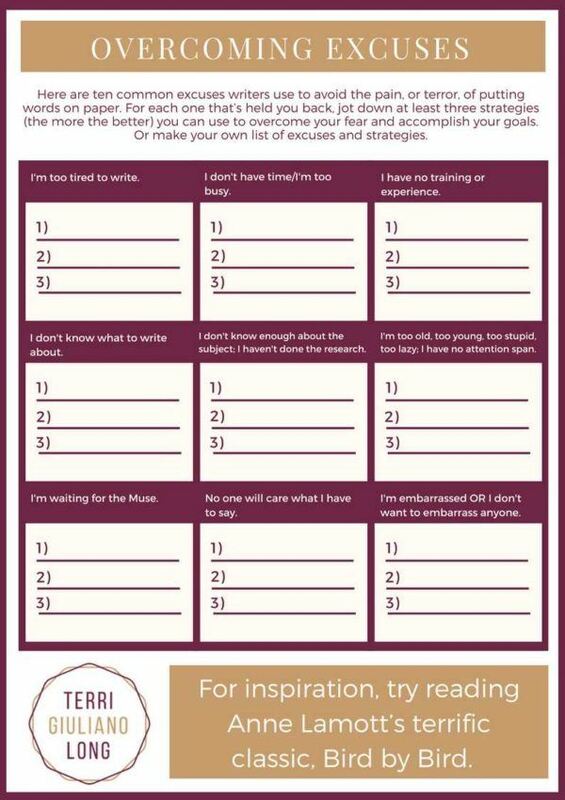 For each one that’s held you back, jot down at least three strategies (the more the better) you can use to overcome your fear and accomplish your goals. 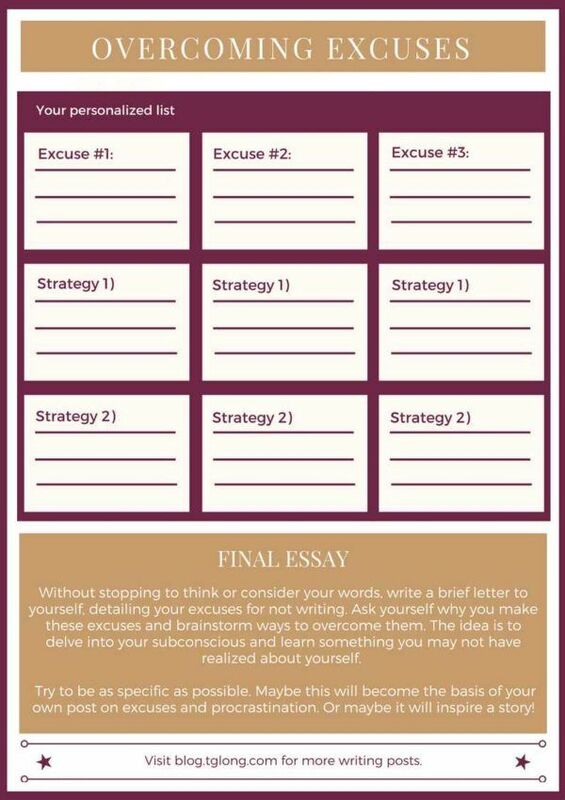 Or make your own list of excuses and strategies. For inspiration, try reading Anne Lamott’s terrific classic, Bird by Bird.